Winter is on its way! It’s time to make your home cosy for the coldest time of the year. The mornings are dark, there’s a crisp wind in the air and the markets are here. Yes, its official, winter is on its way. Say bye to the heatwave of summer 2018 and hello to our famous British winter time. 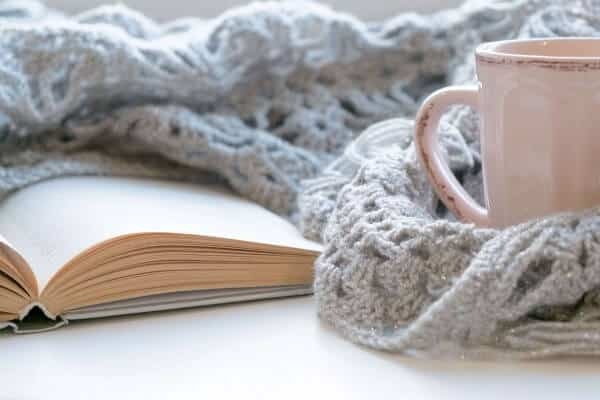 Our weather history shows that a warm summer means an extra cold winter, so it is time to learn how to get cosy! A cosy home is what we all aim for – there is nothing better than walking inside after a day out in the chilly breeze to a house that feels warming and welcoming. I want my family to step into our house and feel relieved to be home. It can be tricky to know exactly what to do to give your home that cosy feeling. Lucky for you, I’ve done all the hard work already and put together a few top tips that will help you achieve this. Here are my six go to tricks for a cosy winter. Spiced aromas really enhance that cosy winter feeling. There are a variety of ways to achieve these exciting scents. Scented candles are a personal favourite of mine, it is such an easy trick to just light your candle once you’re in the house and let the fragrance spread around. For those of you with fiddly fingers around the house, opt for a plug-in or reed diffusers. They get rid of any fire risk you might be worried about and have the perk of a constant aroma without any hassle. Stick to scents such as cinnamon, gingerbread, wood and chestnut for an extra winter feel. A cosy winter can’t exist without a comfortably warm home. One of the worst feelings is walking into a cold house, just as miserable as it is outside. Heating is crucial for a cosy home. The only issue with a constantly heated house is the expense. We all go through that worry of gas heating prices during the winter months. If you’re big on a consistently heated house, consider switching how you heat your home. Heating oil provides a more efficient alternative, while giving your home that traditional cosy feeling. Check out heating oil prices for more information on making the switch! If you really want to prepare for your cosy home you can top up on your heating oil in the summer, saving you even more money as the prices are reduced. Layering – the secret weapon that saves us all from winter. Big woolly jumpers on top of your clothes is an automatic recipe for a cosy day. Layers don’t just stop at your clothes! You can layer up your house as well. No matter where you are in your house, you want to have quick access to a cosy moment. If you have wooden flooring, investing in a fluffy rug to layer on top is a great idea to keep the heat in and keep yourself warm. Flooring that isn’t carpet can get cold quick, so layering with a rug really helps keep that warmth in. Another trick is to have several fluffy blankets decorated over your furniture, so you can grab a blanket and snuggle up anywhere in the house. Once you’ve made your house the perfect temperature and worked on that winter aroma, it’s time to set the tone with lighting. Warm tone dim lighting creates the perfect ambiance for a cosy home, easily achieved through the addition of a dimmer switch. This also means you save some energy by not having your light on the brightest option. A win win situation! Decorative fairy lights can also be incorporated throughout the house for a particularly cosy-cave, perfect for snuggling up with a good book. It’s also a real favourite with children, who love getting involved with hanging them around the house. The dreaded winter draughts sneak in to your house through small gaps, stealing the warmth from your home. Tackling these draughts can help you keep the winter out and the warmth in. You should look for draughts by windows and doors. An easy way to do this is by lighting a candle and placing it in areas where a draughts may come in. If the flame flickers, you have a draught. Draughts can be easily fixed by filling the crevices where the air is coming in; a worthy DIY project to keep your house warm. Nothing screams cosy more than some comfy winter pyjamas. Whether you’re more into a full onesie or two-piece fluffy set, getting into your comfy jammies as soon as you walk into the door means you’re on track for a cosy evening. Paired with some fluffy winter socks and the blankets you have laying around the house you’ll not even remember what it feels like to be cold. Add a hot water bottle for those extra cold evenings. Time to get comfy and cosy! With winter around the corner, it is time to get cosy in your home. When the cold weather hits us, which we’re all starting to feel already, you want to be fully prepared to battle the bitter winds. Having your house prepared for that cosy feeling will make the drab days in winter feel better. So, get your pyjamas on and into the spirit with a hassle-free cosy home! Thanks for stopping by today, what are your tips for a cosy Winter? You can check out my other home posts here.